24.7.1952 Entered service as "GB" open goods wagon. 24.7.1952 Entered service as "GB 888" open goods wagon. 4.8.1952 Entered service as "GB" open goods wagon. 30.7.1952 Entered service as "GB" open goods wagon. 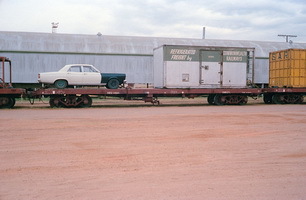 11.9.1961 Converted to "GH" hopper wagon. 23.7.1952 Entered service as "GB" open goods wagon. 121.1.1971 Converted to "GH" opper wagon. 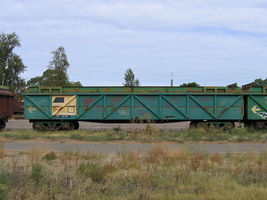 26.8.1964 Converted to "GH 894" hopper wagon. 24.6.1977 Converted to "GHA 894". - Converted to container flat. 29.7.1952 Entered service as "GB" open goods wagon. 25.9.1956 Converted to "RGB" flat to carry NSU diesel locomotives. - Allocated to welded rail rake. 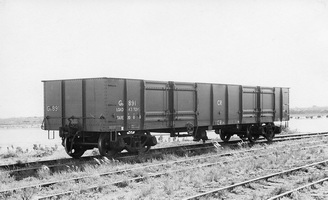 21.5.1976 Converted to "GH" coal wagon. 4.7.1969 Converted to "RGB" flat for use on welded rail rake. 4.10.1968 Converted to narrow gauge flat "NRK 1566" - fitted with 6 wheel bogies. 13.4.1977 Converted to standard gauge "RGB 901". 5.1981 Noted fitted with work van "CC 139". - Allocated to CCE Port Augusta. - Converted to "RGB" flat. - Fitted with generator set and recoded "AZSY". 28.7.1952 Entered service as "GB" open goods wagon. 2005-2006 Converted to "AOPY 32382" [rpf]. - To "AQFY" container flat. 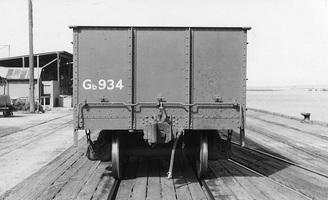 1952 Entered service as "GB" open goods wagon. 21.11.1952 Order as "GB" open wagon but actually entered service as "RGB 913" flat wagon. 2.10.1952 Entered service as "GB" open goods wagon. 26.9.1952 Entered service as "GB 915" open goods wagon. 26.9.1952 Entered service as "GB" open goods wagon. 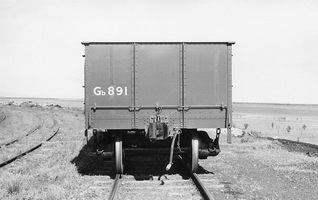 29.3.1960 Converted to "GB 917" goods wagon. 21.11.1952 Order as "GB" open wagon but actually entered service as "RGB 918" flat wagon. 26.11.1952 Entered service as "RGB 919" flat wagon. 27.4.1960 Converted "GB 919" open goods wagon. 14.11.1961 Converted to "GH 920". 21.11.1952 Entered service as "GB" open goods wagon. 23.9.1952 Entered service as "GB" open goods wagon. 19.9.1952 Entered service as "GB" open goods wagon. 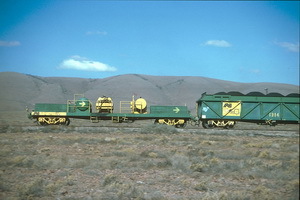 22.4.1976 Converted to "GH" coal wagon. - Converted back to "GB". - Fitted with motor body brakets. 25.1.1978 Converted to "GB 928" for general traffic. 18.9.1952 Entered service as "GB" open goods wagon. - Converted to "RGB" flat wagon. - To "AZFY" for use as CCE compressor wagon. 29.9.1952 Entered service as "GB" open goods wagon. 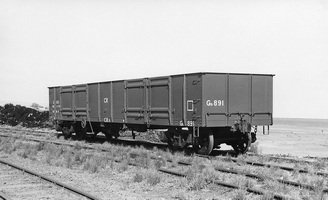 23.4.1976 Converted to "GH" coal wagon. 2005-2006 Converted to "AOPY 32408" [rpf]. 1.10.1952 Entered service as "GB" open goods wagon. 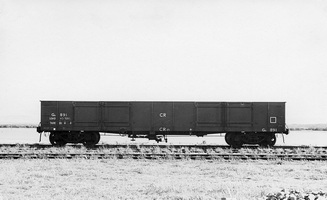 1.6.1976 Converted to "GH" coal wagon. 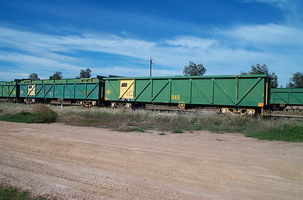 22.8.1952 Entered service as "RGB" flat wagon. 2.1965 Converted from "GB" to "GBX". 10.8.1955 Entered service as "GB" open goods wagon. 21.9.1955 Entered service as "GB" open goods wagon. 22.8.1955 Entered service as "RGB" flat wagon. 12.8.1955 Entered service as "GB" open goods wagon. 21.11.1955 Entered service as "RGB" flat wagon. 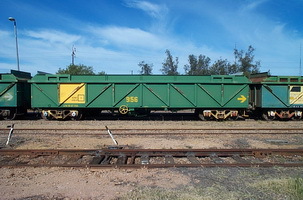 - Converted to "RGB" flat wagon - may have actually entered service as "RGB" rather than as "GB". 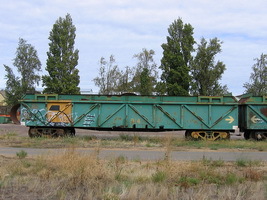 - To "AZVL" wheel and axle set flat for use by ME branch between Islington and Port Augusta workshops. 2.9.1955 Entered service as "GB" open goods wagon. 17.8.1955 Entered service as "GB" open goods wagon. 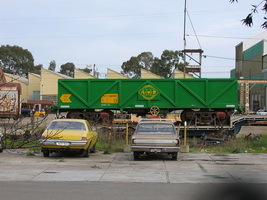 1976 Converted to "GH" coal wagon. 1978 Converted back to "GB". - To welded rail rake. - Allocate to CCE Port Augusta. 14.9.1955 Entered service as "GB" open goods wagon. 21.11.1952 Entered service as "RGB" flat wagon. 22.8.1955 Entered service as "RGB" flat wagon, was ordered as "GB" open goods wagon. - Converted to welded rail rake. 8.8.1955 Entered service as "GB" open goods wagon. - Used for sleeper storage. 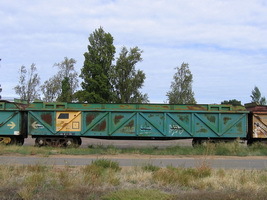 - To "AZOF" for use on Alice Springs accident train. 16.8.1955 Entered service as "GB" open goods wagon. 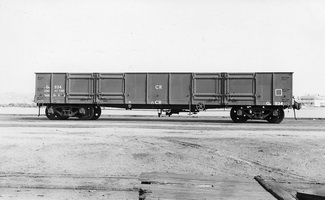 2.1955 Entered service as "RGB" flat wagon. - Used to store sleepers. 11.8.1955 Entered service as "RGB" flat wagon. 18.8..1955 Entered service as "RGB" flat wagon. 26.9.1955 Entered service as "GB" open goods wagon. 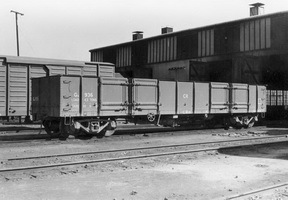 5.3.1976 Converted to "GH 965" coal wagon. 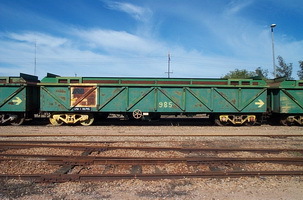 18.8.1955 Entered service as "RGB" flat wagon. 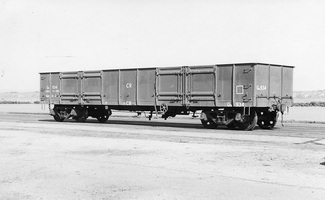 5.4.1976 Converted to "GH" coal wagon. 26.8.1955 Entered service as "GB" open goods wagon. 21.11.1952 Entered service as "RGB" flat wagon, ordered as "GB" open goods wagon. 29.8.1955 Entered service as "GB" open goods wagon. 14.9.1959 Converted to narrow gauge "NRG 1463". - Converted to standard gauge as "RGB 970". - Used with Mobile Crane Alice Springs. - Fitted with generator set and coded "AZGF". 27.9.1955 Entered service as "GB" open goods wagon. - Converted to a flat wagon with generator set, coded "AZGY". 26.11.1952 Entered service as "RGB" flat wagon, ordered as "GB" open goods wagon. 30.8.1955 Entered service as "GB" open goods wagon. 15.9.1955 Entered service as "GB" open goods wagon. 4.8.1955 Entered service as "GB" open goods wagon. 26.11.1955 Entered service as "RGB" flat wagon, ordered as "GB" open goods wagon. 28.7.1955 Entered service as "GB" open goods wagon. 25.7.1955 Entered service as "GB" open goods wagon. 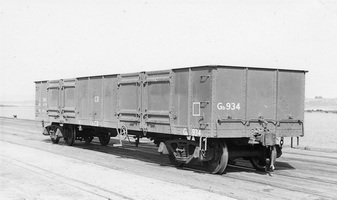 1952 Entered service as "RGB" flat wagon, ordered as "GB" open goods wagon.